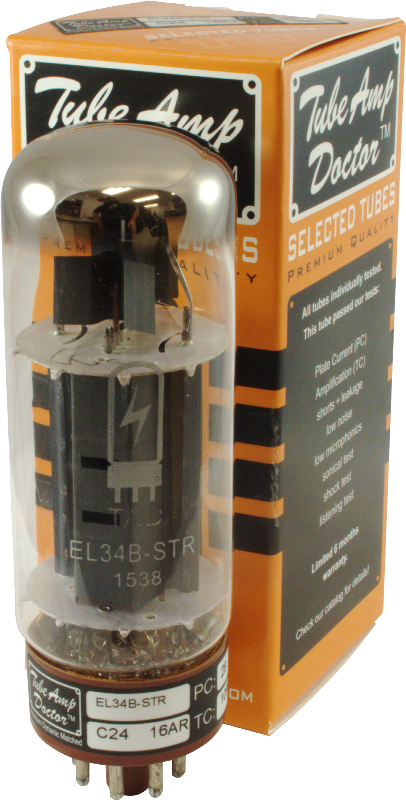 Sensational new high-gain EL34 tube with a very dynamic tone. An authentic remake of the British Mullard EL34. The clear and harmonic open top end allows for great clean tone and at the same time the TAD EL34B-STR offers incredibly powerful mids and equally powerful bass. The golden control grid and especially large cooling grids guarantee maximum stability and reliability. Consequently, this EL34 provides a maximum of gain and dynamic response. Can replace any 6CA7 or KT77. Matched Pair T-EL34B-TAD-MP Packaging Dimensions 2 in. x 4 in. x 4.6 in. Matched Pair T-EL34B-TAD-MP Weight 0.4 lbs. Matched Quad T-EL34B-TAD-MQ Packaging Dimensions 2 in. x 8 in. x 4.6 in. Matched Quad T-EL34B-TAD-MQ Weight 0.8 lbs. Single T-EL34B-TAD Packaging Dimensions 2 in. x 2 in. x 4.6 in. Single T-EL34B-TAD Weight 0.2 lbs.